(New American Bible, John 3:19-21). Each encounter with an inhospitable wickedness is often precluded by darkness and, commonly, the descent into a cave or woods. The first encounter with this theme is when the companions find themselves in want of food at night just after fording a river and losing some stores. The dwarves find themselves camping in the dark and urging their burglar to go through a “dark mass of trees” that once in the trees the surrounding area is found to be “pitch dark” (33, 34). Following the literary tradition, by going into the dark the protagonists are sure to encounter trouble. Trouble is what Bilbo and the dwarves find first in the Trolls. In the end, the trouble with the Trolls is easily conquered, and does not come across as too menacing and difficult to overcome. For all that is needed to chases away the dark (evil) is light. However, with each trip into the darkness, the danger increases and the threat of not emerging from the descent into darkness is intensified. In the next descent into darkness the Travelers encounter the fearsome goblins. Before the descent into the goblin caves, the event is preceded by night and a double darkness by the travelers entering a dark cave. When the goblins find the dwarves, wizard, and hobbit camping on their stoop, the dwarves are immediately taken by the dark creatures into a darker kind of dark, to a place “Deep, deep, dark, such as only goblins . . . can see through” and still adding to the sense of darkness the dwarves are taken farther “down and down” in the mountain (60). Moreover, the Great Goblin, upon discovering the dwarves’ elven blades, commands in his rage to “take [the dwarves] away to dark holes full of snakes, and never let them see the light again” (64). Like with the trolls, the party only gains salvation from the goblins’ caves by means of light in various forms: Gandalf’s magic, the glowing elven weaponry, and the sun outside the caves. While in the Misty Mountains, Bilbo takes his first of several lone descents into darkness. Already deep, deep, and dark in the misty mountains, Bilbo awakes after being rendered unconscious by a knock on the head and finds that “He could hear nothing, see nothing, and he could feel nothing except the stone of the floor” (68). Continuing, Bilbo makes his way and “On and on he went, and down and down” until he encounters “a deep dark subterranean lake” which he “did not dare to wade out into the darkness” (70-71). There “Deep down there by the dark water” Bilbo encounters Gollum. The text tells the reader that Gollum was called “Gollum” because he was “as dark as darkness” (71). Layer upon layer of darkness is added to Bilbo's encounter with Gollum to the extent that one must question if the little hobbit will emerge from the very deep dark or if he will be devoured if not by Gollum then by the darkness and lost forever. After escaping the Goblins, sometime after the party’s entrance into Mirkwood, and before being taken by the spiders in Mirkwood, darkness, as well as its variants, are mentioned no less than ten times, which more than doubles the preceding dark references before encountering evil in the form of trolls, goblins, wargs, and Gollum. 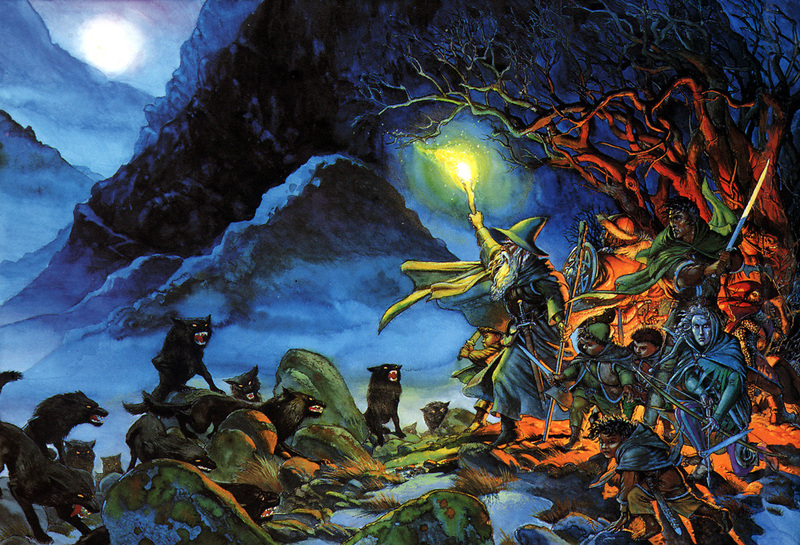 In addition to the numerous references of darkness, the hobbit and dwarves find themselves in a place of darkness similar to the “tunnels of the goblins” (141), which places both the reader and the travelers in a certain mindset in which one half expects the dwarves to be taken again by goblins or creatures of equal malice. What is quickly evident is that Mirkwood is a place void of light and unfriendly to light of any sort. Any attempt to produce light by means of fire is quickly thwarted by thousands of “dark-grey and black moths” swarming the travelers (142). Furthermore, “mirk” is an archaic spelling of the modern “murk” which means “dark” (“murk”). Combining “mirk” with “wood” one realizes that the travelers are entering into a dark forest. Mirkwood if filled with dark plants, black bats, black butterflies and even a black river. With each mention of darkness or blackness, another layer of the impending encounter with evil is heightened so much so that one might assume that the dwarves will soon encounter the most wicked of beasts while traveling in Mirkwood. Though they do not encounter goblins or Smaug, it is perhaps the most danger the dwarves find themselves in as it is the closet they come to being lost to the lack of hospitable spiders. The murkiness is further emphasized when Bilbo comes to “a place of dense black shadow ahead of him, black even for that forest, like a patch of midnight that had never been cleared away” (157). The apex of darkness happens while encountering Smaug, the travelers find a new kind of darkness in the dragon’s den. It is a darkness in which Bilbo, for the first time, cannot function without light. As if Smaug himself has absorbed all sparks and illuminations in the room, and though the worm himself glows, his domain is darkness ever present and all consuming. The dwarves find themselves in an ever-present darkness for many days upon having to enter the tunnel with the secret door leading to the dragon’s lair. Moreover, the burglar’s feeling that the darkness is growing deeper and deeper while in the tunnel is the foreshadowing of the darkness that is soon to come to Lake-town. It is also telling that the most evil act in the book, the destruction of an entire town, coincides with the dwarves and Bilbo entering the darkest dark of Smaug’s lair. The lesson, too plain and clear to be seen by those who are boring and plain, is that it is only by going through the dark that Bilbo and his companions are exalted. That is, the darkness and the troubles found in those dark places where wickedness and darkness are intimately joined that to separate darkness from evil in “The Hobbit” would be like trying to separate the moon from the night is the vehicle for growth of virtue: courage, prudence, temperance, and justice. If at any time Bilbo or the dwarves failed to continue their journey their progress to exaltation and growth of virtue would come to an end, and Bilbo would be great in neither his world or ours. Though there are set backs and losses in the face of evil, it serves no purpose to simply give up. For where would Judaism and Christianity be if Abraham had not preserved through his own dark moments and tests.